It turns out that all you need to do to have a chance to step foot in a galaxy far, far, away is donate cash to a charitable cause. In partnership with the United States Fund for UNICEF, Disney, “Star Wars Episode VII” director J.J. Abrams, Lucasfilm, and Omaze.com are giving fans a chance to have a walk-on role in the upcoming chapter in the sci-fi saga. With the launch of “Star Wars: Force for Change,” fans of the saga will be entered into a drawing for that prize by donating money to benefit UNICEF’s Innovation Labs and Programs. 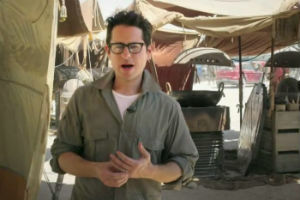 In addition to these funds, Disney has already donated $1 million to benefit the new initiative, which Abrams in a video from the set of the film in Abu Dhabi described as a program “dedicated to finding creative solutions to some of the world’s biggest problems.” Entries will be accepted until 11:59 p.m., July 18. Donors who log onto http://www.omaze.com/experiences/starwars-episode-vii will have the option to donate anywhere from $10 to $50,000. Depending on how much you choose to donate, you will have your name entered a number of times equal to the initial $10 donation. For example, donating $50,000 will have your name entered 5,000 times. Donors will also receive special gifts depending on their level of donation, including a private screening of “Episode VII” before it’s release on December 18, 2015. Disney purchased Lucasfilm from the original saga’s creator, George Lucas, on October 30, 2012 for $4.05 billion and immediately announced the creation of a new series of “Star Wars” films. Lucas pledged to give the profits from Disney’s purchase to foundations that focus on education. If you want the chance to be a Jedi, droid, or some form of computer generated creature, head to http://www.omaze.com/experiences/starwars-episode-vii to make your donation.